Well, it’s the first weekend of August- the beginning of the end of summer (womp womp). There is a lot of music, dancing, and art going on this weekend- so get in your kicks while you can! I’ve only highlighted a very small portion of the events going on this weekend below. You can find all the rest- including about half a dozen live music shows per night- on the calendar. This is totally not the actual tent you will be dancing under. But it will still be lots of fun and pretty, you’ll see! I like to tell people that contradancing is just about the most fun you can have sober. It’s like line dancing in that the steps are all laid out so you know what to do. It’s a little geometrical, as there are patterns to figure out. And you get to spin around! Wheeeeeeee! 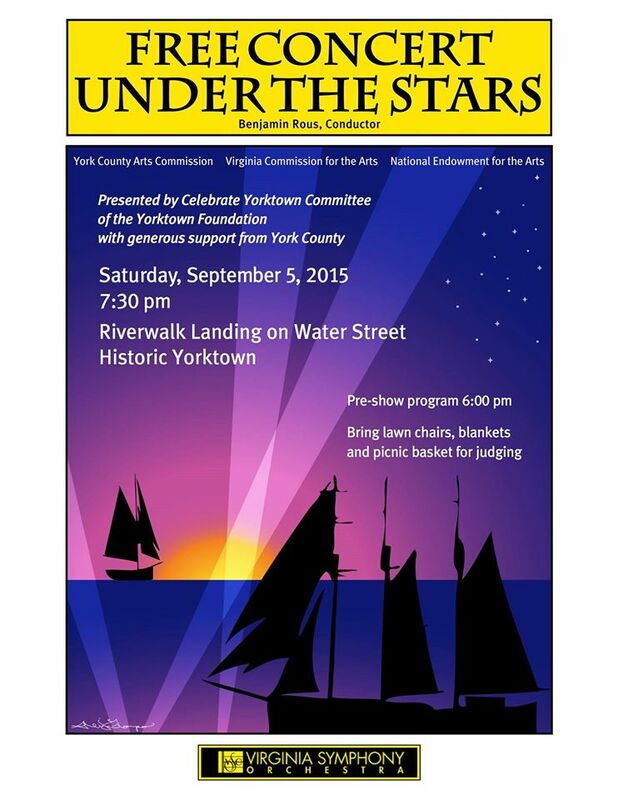 The Norfolk Contra Dancers are having their Blue Moon dance Friday at the Waterman’s Museum in Yorktown. It’s a beautiful setting right on the river. Carrot Tree will be serving Blue Crab with fixins starting at 5pm, but participants are also encouraged to bring potluck dishes. Tickets are only $10 and I guarantee you will have fun! Will it be hot? Yes! Will it be worth it? Absolutely! Plus, the Wampler Brothers will be playing that night at the Water Street Grille in case you get hot or tired but still want some tunes. Have you noticed all the butterflies around town lately? Here’s your chance to learn more about them and view many beautiful varieties. 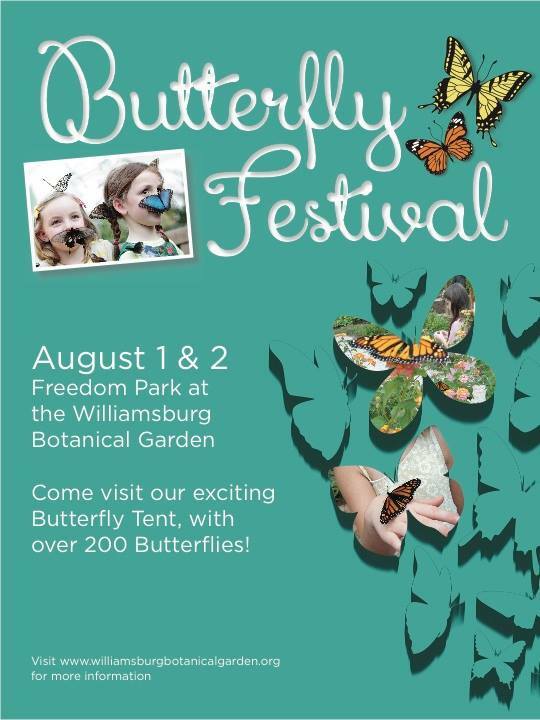 Together Williamsburg Botanical Garden and Virginia Master Naturalists Historic Rivers Chapter are presenting a Butterfly Festival at Williamsburg Botanical Garden this Saturday and Sunday. Walk through the Butterfly House and hold and feed a variety of butterflies that are native to Virginia. There will be information about what plants can attract butterflies to a garden and about the decline of the Monarch butterfly population and what you can do about it. At 1 and 3 pm, bring your kids, because the first 10 families to attend programs at that time will get a live pupa they can take home and watch as it transforms into a butterfly! For more information, the WY Daily has an article about the event. Art in the ‘Burg is a new bi-weekly art festival featuring Historic Triangle artists and craftsmen hosted by Colonial Folk Art. It’s held in Williamsburg’s Art District (yes, it really exists, it’s around Lafayette and Richmond Road between Extraordinary Cupcakes and the Dunkin Donuts; 110 Bacon Ave for your GPS). This weekend, the Symphonia is playing a bunch of outdoor concerts at Lake Matoaka Ampitheater. The most affordable concert is Sunday at 11:30 am- Peter and the Wolf for the kiddos ($5 for lawn tickets). They’re also doing a night of romantic songs on Friday and a movie music concert on Saturday for $25 a person. Buuuuuuut if you want to wait for a FREE outdoor symphony concert, the VSO is playing at Lake Matoaka on September 3 and at Yorktown the Saturday of Labor Day weekend . . .
Want more? Check out the free admission at PFAC this weekend, or the kids fishing tournament, or the programs free for residents over on the calendar page. There is really so much to do in Williamsburg! Thank you for reading and have a great weekend. Hey all! Admittedly Monday and Tuesday are a little empty, but I’m out of town this weekend and I had to schedule this on Thursday, before a lot of the information came out for next week. Nevertheless, still lots to do, especially Wednesday and Thursday! 7pm: Meditation class at the UU church– free, donations accepted- hosted by Ben, who is not “woo-woo” at all but rather very down-to-earth- highly recommended! 7pm: Concert on Merchant’s Square- Slapnation performs! 1970’s Disco, and Top 40 Dance music from the 1980s to today- so get out and DANCE YOUR PANTS OFF! 7:30pm: $5 yoga class at Berrybody– with soothing lavender towels! 8pm: Lukas Nelson & Promise of the Real in Concert at the Kimball- $15- described as “cowboy hippy surf rock”?? but hey it’s a national act so they must be good right? 6pm: Thursday Night Adventure Night– last week is was a Softserve Showdown- this weeks it’s a Geocache Dash! I wrote a guest post for Colonial Williamsburg about their new live comedy, A Servant of Two Masters. It is really funny and great for all ages! You can win free tickets if you make a comment on the post, so don’t miss out! What’s Happening Williamsburg is now on Instagram! Follow @whatshappeningwilliamsburg to get real-time updates on events in the Burg. Guys, I’m sorry this posted late. I made a mistake in scheduling the post.